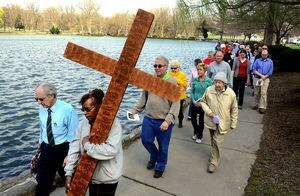 The Good Friday Cross-Walk will start at 1:00 pm on April 19 at City Park at the Gazebo along the lake close to the Museum. People can park in the lot adjacent to the Museum. There will be seven stations with a scripture reading, meditation, prayer and song at each stop. The journey will walk around the two lakes and conclude at the grottoes adjacent to the Bandshell. Approximate time will be 90 minutes. The route is handicapped accessible. Park bathrooms will be open the day of the event. Please note: the venue for this event has been changed! Due to high chance of thunderstorms it will be held indoors at First Christian Church.